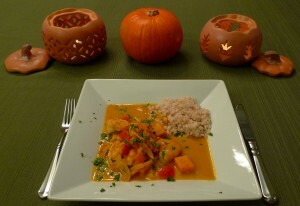 I made a pumpkin shrimp curry dish for dinner this Halloween. It is definitely one I’ll keep in my recipe archives to make again and again this fall. 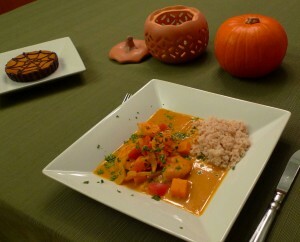 The pumpkin and butternut squash with a little bit of spice made it the perfect dish for my favorite autumn holiday. 🙂 Yummy and festive! The recipe is originally from Bon Appétit magazine. I substituted light coconut milk instead of regular, and brown rice instead of white, but otherwise followed the recipe pretty closely. Heat olive oil in a large saucepan over medium heat. Add onion and ginger; sauté until soft, about 8 minutes. Add garlic; cook for 1 minute. 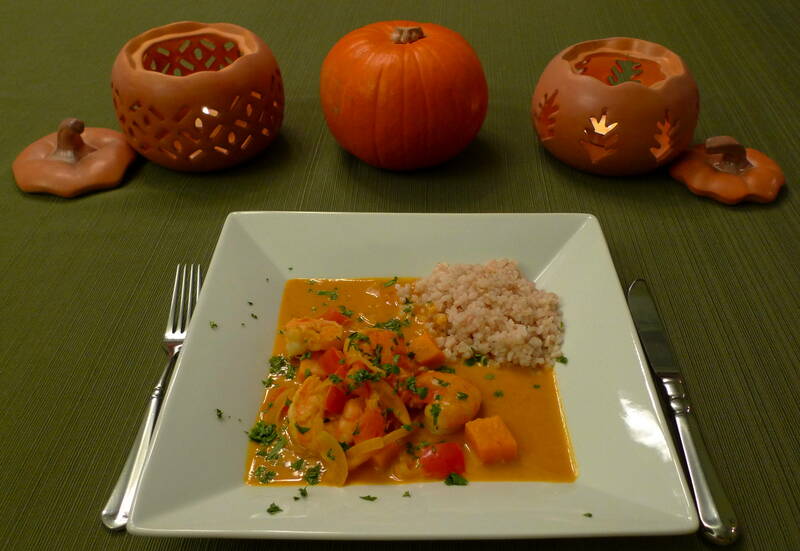 Stir in plum tomato and pumpkin purée; cook, stirring frequently, until pumpkin is golden brown, about 10 minutes. Add vegetable broth, coconut milk, curry powder, and cayenne pepper; simmer for 20 minutes. Add butternut squash, shrimp, and lime juice. Simmer until shrimp are cooked and squash is warm. Serve with a side of rice and a sprinkling of chopped cilantro.